Derived from an ancient clay cooking device known as a “kamado” the Big Green Egg is a blend of the best of ancient wisdom, modern technology and proprietary processes, resulting in a far superior product that is stronger, more durable and provides better heat insulation than any other outdoor cooker on the market. Many grilling accessories are available to provide maximum versatility in cooking styles. Nests: designed to raise your EGG to a comfortable cooking height while allowing for easy availability. Nests are made of durable porcelain coated steel and most models include casters. Mates and Shelves: Big Green Egg 100% Natural Cedar Wood Mates and Composites Shelves are used with an EGG in a Nest and provide convenient working or serving space for you EGG and can be folded down when not in use. Tables: Our Big Green Egg Tables are made in the USA from cypress wood and offer ample working and serving space. All tables come equipped with heavy-duty locking casters. Covers: All covers are made from a ventilated, heavy-duty, weatherproof fabric. Big Green Egg Natural Lump Charcoal: a premium product made from 100% domestic oak and hickory wood and contains no by-products, chemical fillers or petroleum additives. Electric Charcoal Starter: this handy device, with a heat resistant handle, will have you cooking in minutes without even striking a match! 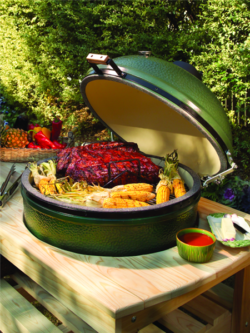 Ceramic EGGcessories: the Big Green Egg has a number of ceramic plates and baking stones used for indirect cooking on the Big Green Egg, it provides a barrier between the food and the fire, turning your EGG into an outdoor convection oven. Grids: For the perfect sear marks, specialty cooking grids are available in cast iron and porcelain. Tools like the Grill Gripper make easily and safely moving them a breeze. Grilling Tools: from the stainless steel grilling tongs to the Jalapeno Grill Rack & Corer Set, Big Green Egg has the tools needed to give you the upper hand on outdoor cooking. And for you hands, there’s the Pit Mitt BBQ Glove. Pizza Tools: the Pizza Peel is a useful tool for sliding pizza in and out of a hot EGG. And once it’s done, our Rocking Pizza Cutter swiftly cuts the pizza into uniform slices. Racks and Pans: the V-Rack works for roasts and poultry in the upright position but can be flipped over to serve as an effective rib rack, making it a great tool. We also offer a variety of Perforated Grids, stainless steel and ceramic Poultry Roasters, Tiered Racks and Baskets. There’s even a basket for making the perfectly cooked sliders! Thermometers: Know the heat, know your thermometer. Big Green Egg offers both instant read and digital thermometers. The Big Green Egg BBQ Guru is the ultimate device in temperature control technology. Its microprocessor enables automatic control over the internal temperature of the EGG while food is being cooked, so you can forget about it and relax. The Big Green Egg stands alone as the most versatile barbecue and outdoor cooking product on the market, with more capabilities than all other conventional cookers combined. It truly is The Ultimate Cooking Experience! Sear steaks, chops, burgers and seafood with a flavor-packed crust unmatched by other grills. High temperature “steak house” grilling – even at 750ºF/ 400ºC – is quick, easy and delicious! The insulating ceramics of the Big Green Egg allow for precise temperature control at low heat. You’ll enjoy succulent results with turkey, ham, ribs or any of your favorite cuts. Want to slow cook at low heat for ten to twelve hours or longer? No problem! 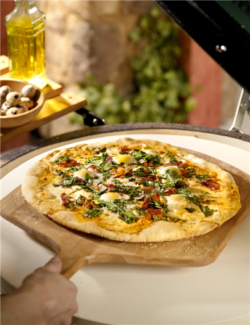 The Big Green Egg will bake your bread, pizza, casseroles, cakes and pies better and quicker than your kitchen oven! You must experience this to believe it. . . you may never cook indoors again! No Smoker performs more efficiently than a Big Green Egg. A wide variety of sumptuous flavor combinations and aromas to your cooking with our aromatic chips and wood chunks. . . since each type of wood reacts differently with meat, poultry or fish, the flavor combinations are endless. 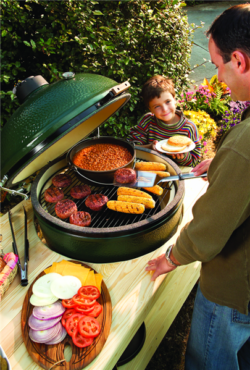 The Big Green Egg retains heat and moisture so well that foods just don’t dry out! Poultry, lamb, beef and vegetables are naturally tastier because the juices and flavors stay locked inside. Everything tastes better cooked on an Egg!